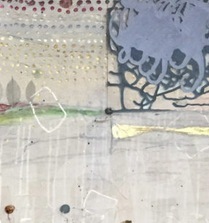 Nature: “The One, Ginkgo Horizon”, 60×48, mixed media on canvas. This entry was posted in Fine Art Process, Notes: Karrie Ross and tagged contemporary art, ginkgo in my art, los angeles artist, new work, Notes: Karrie Ross, painting over a canvas on October 14, 2016 by Karrie. Book Signing and Art… Be there!! It’s just ART! Right? Opinions and mine have a basis of nothing other than my life experience. I observe. I participate. I am. Play and creativity and a fighter of depression….!!! 2013 – 04 A little history about …. The end of 2012 haiku. Q: How do you know when a painting is done? Customize Your Breasts with a Karrie Ross Original Artwork Bustier! Why a Red Dot? Karrie discusses her concept. Exploring the “DOT, DROP, DRIP” and sometimes spatter! Got Meow? Got Woofs? Got Love? Scientific American on Creativity… a very interesting article. “Oh The Two of Us” new Spiral Series bustiers… you gotta see them! Karrie is doing “cartoon avatars”….when you just don’t want to feel “real”! Spiral Series new sub-category… Energy Blooms! Benefit Four: Responsibiltiy and Committment to the Co-Op Gallery Experience. Benefit Three: Gallery Artists need to know how to be Business People too! What do you think happens when you paint over older paintings? Benefit Two: Community and The Art Group, Co-Op Galley Experience. What happens when your style changes… can you paint it again down the road? Art Lighting… not what you are thinking… this is interactive and amazing! What Part Does a “First” Painting Play in Creating a Series No. 2? “GEM” at Gallery 825: See me there! Does “Levy Flight” and Art Collecting Have A Connection?